One of the most popular surfboard templates of all time, the Fish has always been an essential addition to any quiver. 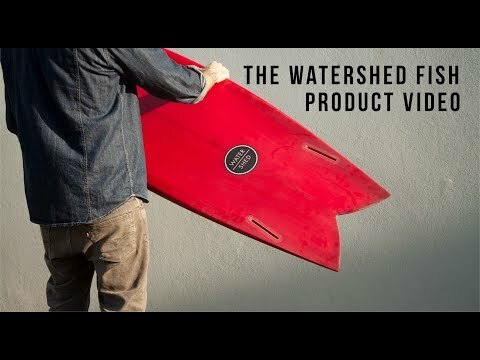 Aesthetically stunning but very functional and forgiving, the fish is a shorter board that boasts a lot of volume for it's length. Our retro fish doesn't detract from this classic style. If it aint broke, don't fix it. The rails are pinched and tucked right under into the ‘V’ bottom. This is to maintain as much control as possible at those higher speeds the lower rocker offers. With so much of the board engaged in the water, the softer bottomed, pinched rails will hold to the face more than usual for some fish meaning you can really trust leaning through turns. The template is wide from tail to centre which gives you that fish forward trajectory that we all look for in a twin fin. The nose is pulled in on the shoulders to shorten the rail line making sure you’re not bogging down at lower speeds. When flying, the details we have added for control will come into play blending a perfect combination of speed and hold as you knife through turns. 5'10"" x 21 1/4" x 2 5/8"